Postal service in America began in the private inns and coffee houses of seventeenth-century seaports. These establishments provided well-known, public places to send and collect letters and packets. The letters and packets were mostly sent to or received from the mother county. Until roads were developed or native trails or paths improved, communication between or among colonies was limited, with sailing ships providing the safest and most reliable method to transport letters and goods. The British were the main colonial power for the thirteen American Colonies, and the only one after 1763. They appointed postmasters, established rates, and introduced postmarks, among other things. The British influence is reflected in select sources throughout the bibliography. Collectors and historians have conducted intensive research into Colonial American postal affairs. Their investigations offer insights into the details of the various posts and the people engaged in the administration of them. Most of the sources noted are from collectors. Many collectors acquire and collect stampless covers, some with postmarks of the Colonial period. Illustrations of items in their collections often accompany their writings. 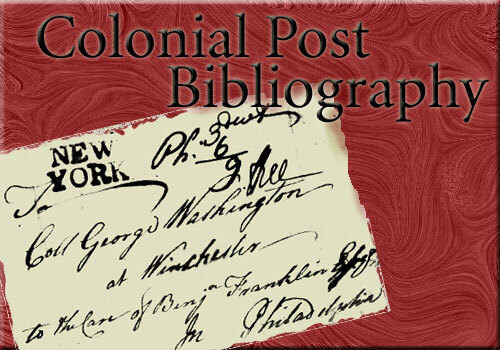 We present the following bibliography to promote the study of Colonial American postal service in this library. Our focus is on the European settlements that became the United States of America. The annotations are to introduce the subject, and to assist one in determining the usefulness of a work. An introduction to Colonial postal affairs may include sources on currency, transportation, literacy, roads, availability of paper and inks, printers and newspapers, and related subjects. Fortunately, many of these subjects are covered by sources in this library. One complete article is presented in the bibliography, and many annotations are lengthy. Two works are in the National Museum of American History (NMAH) Branch Library, and one from the Anacostia Museum (ANAC) Branch Library. Timothy Carr and Debra Shumate compiled this bibliography. Mrs. Shumate was a graduate student in library science at The Catholic University of America when she worked on it. Please send comments about this bibliography to Timothy Carr, Branch Librarian, National Postal Museum, Smithsonian Institution, Washington, D.C. 20560-0570. We wish to thank Steven M. Roth and Herbert A. Trenchard for assistance with this bibliography. Acts of Parliament Relating to the Post Office: From 9 Anne to 1 Victoria 1710-1837. Devon: Britannia Stamp Bureau, 1977. Acts establishing a general post office for all British dominions during Queen Anne's reign (1702-14), with a portion of the revenues to be set aside for war and other affairs of state (p. 1-6). Reprint of first edition, 1838. Index. Benjamin Franklin Exhibition in the National Philatelic Museum, January 15 - March 15, 1951. Philadelphia: National Philatelic Museum, 1951. Exhibition catalog, with essay on Franklin's service to British as Deputy and Postmaster General, 1737-76, of the American Colonies. Bounds, Harvey Cochran. Postal History of Delaware. Newark: Press of Kells, 1938. Claims the Swedes - first settlers of Delaware - and the Dutch were not road builders; therefore, communication suffered until English, circa 1664, captured Dutch settlements on South and Delaware Rivers. "William Penn in July, 1683, granted authority to one Henry Waldy of Tekonay to establish a weekly post...[t]hus, New Castle became the first post-town in Delaware." Bibliography. Braake, Alex L. ter, Coordinator. The Posted Letter in Colonial and Revolutionary America. State College, PA: American Philatelic Research Library, 1975. Comprehensive coverage of the post, 1628-1790, by nine contributors, in celebration of the bicentennial of the United States of America. Sources, illustrations, maps, bibliography and index. Cawley, James and Margaret. The First New York - Philadelphia Stage Road. Rutherford, NJ: Fairleigh Dickinson University Press, 1981. Tracing of the history of a path to a road, with specifications of "four chains or ninety-nine feet in width" - not met, however. Roads permitted regular stages that carried mail, among other things. Bibliography and illustrations. Clark, Charles E. The Public Prints: the Newspaper in Anglo-American Culture, 1665-1740. New York:Oxford University Press, 1994. Scholarly review of American newspapers preceded by an overview of British newspaper tradition and history. Sources, index and appendix. Coles, William C., Jr. The Postal Markings of New Jersey Stampless Covers. Chicago: Collectors Club of Chicago, 1983. Catalog of postal markings used during stampless cover period ending 1857. Chronological and alphabetical listing of New Jersey towns and postmasters. Postage rates from 1692. Map of New Jersey counties from 1683. Bibliography. Maps of thirty-four (34) routes, including: Annapolis to Alexandria, Fredericksburg, Todd's Ordinary and Williamsburg; New York to Brunswick, Blackhorse, Kingston, Philadelphia, Poughkeepsie, and Stratford; Williamsburg to Ayletts Warehouse, Hooe's ferry, Port Royal and Sneed's Ordinary. Daniels, J.H. A History of British Postmarks.London: Upcott Gill, 1898. "The introduction of the system of impressing letters with marks by the postal authorities began in 1660." Presents English, Scottish and Irish postmarks. British postmarks were used in the colonies. Dibden, W.G. Stitt. The Mail Routes to the West Indies: a Research Document Compiled from Official and Other Sources. Petworth, England: Postal History Society, 1966. Information on packets, packet-boat agents, and a listing of royal packet-boats (p. 81-100). Bibliography, illustrations and index. Donald, Archie. The Posts of Sevenoaks in Kent. Tenterden, England: Woodvale, Press, 1992. Examination of British postal service in a select area from 1085 A.D. The British system was a model for postal services in Colonial America. Sources, appendices, chronology, illustrations and index. Dow, Sterling T. Maine Postal History and Postmarks. Lawrence, MA: Quarterman Publications, 1976. Includes a history of the Colonial Post from 1639. Illustrations. Sources in text. Earle, Alice Morse. Stage Coach and Tavern Days. New York: Macmillan, 1900. Detailed narrative on means of communication and transportation, with postal matters scattered throughout text. See index under "mail," "mail-coaches," "mail stage carriages," "post," and post-riders." Illustrations. Ernst, Carl Wilhelm. Postal Service in Boston, 1639-1893. Trustees of the Boston Public Library, 1975. Finlay, Hugh. The Hugh Finlay Journal: Colonial Postal History, 1773-1774. U.S. Philatelic Classics Society, 1975.
Review of postal service in the Thirteen Colonies by the Surveyor of the Post Roads (1772-4). Covers New England and the South. Includes collection of quotations on the Colonial Post compiled in 1867 by Frank H. Norton of the Mercantile Library, Brooklyn. Reprint of 1867 edition, with citations, maps and index. Foster, Reginald K. The Postmark on a Letter. London: W. & R. Chambers, Ltd., 1952. States that Colonel Henry Bishop, British Postmaster-General, is the inventor of the postmark. Bishop printed an announcement in Mercurius Publicus from April 25 to May 2, 1661, "and to prevent any neglect of the Letter-Carryers in the speedy delivery of Letters from the said Office: It is notifyed that the days of the recept of every Letter at the Office is printed upon the Letter and the Letter-Carryers ought to deliver them the same day in the summer: and the next morning at farthest in the Winter: and if any fayler be complained of at the Post Office it shall be redressed...." (p. 16). Bishop marks were used in Colonial North America. Bibliography. Fuller, Wayne E. The American Mail; enlarger of the common life. Chicago: University of Chicago Press, 1972. Scholarly examination of the American Post;chapter one on the Colonial Post (thirty-nine pages). Chronology, bibliographical essays and index. Harlow, Alvin F. Old Post Bags: the Story of the Sending of a Letter in Ancient and Modern Times. New York: D. Appleton and Company, 1928. Colonial Post from 1639 along with coffee house post offices, the postal system of William Penn, the Thomas Neale Patent, the Continental Congress Post, and the Constitutional Post. Bibliography, illustrations and index. Holmes, Oliver W.Stagecoach Days in the District of Columbia Washington, D.C.: Columbia Historical Society, 1948. Covers mostly post-1789 transportation, with the following argument for the delay in road construction along the eastern seaboard: "For the entire colonial period water transportation had been dominant. It is natural in the opening of a country that the waterways are used to their available extent before land routes are developed. The roads of the sea, the bays, and the rivers are already made...[where] the land is rough and heavily wooded, as along the Atlantic seaboard, the building of roads for wheeled vehicles will be long delayed. And in a country so well provided with deep bays, estuaries, and navigable rivers as the eastern coast of America, such roads will be less needed." Sources. Joyce, Herbert. The History of the Post Office from Its Establishment down to 1836.London: Richard Bentley & Son, 1893. British history of American Colonial Post, 1692-1707. Thomas Neale Patent. The dismissal of Benjamin Franklin as Postmaster of Philadelphia. Index. Kielbowicz, Richard B. News in the Mail: the Press, Post Office, and Public Information, 1700-1860's. New York: Greenwood Press, 1989. Scholarly review of the Colonial Post and the press (chapter two). Bibliography. Konwiser, Harry M. American Philatelic Dictionary and Colonial and Revolutionary Posts. New York: Jacques Minkus, 1947. Postage stamp collecting definitions with a reprint of Colonial and Revolutionary Posts. Select complete dictionary entries: "First American Postmark-When the Massachusetts General Court enacted postal legislation, (1692) that Colonial body specified that each letter must be marked in print showing the date on which it was received at the office; First Postal Map-Made by H. Moll of London, 1729, shows the 'Great Post Road' (Portsmouth, N.H. to Philadelphia); Franklin-Benjamin Franklin was appointed postmaster at Philadelphia in 1737, and with William Hunter was made Postmaster General for the American Colonies (1753) representing the English Crown until 1774 when he was discharged. The Continental Congress appointed him Postmaster General in 1775; French Post Office in America -From 1669 to 1718 the French had built a chain of posts from Quebec to New Orleans." Bibliography and illustrations. Konwiser, Harry M. Colonial and Revolutionary Posts: a History of the American Postal Systems; Colonial and Revolutionary Periods. Richmond: Press of the Dietz Printing Co., 1931. "Letter conveyance was an uncertain procedure in the early days of the American Colonial Period, in effect being as primitive as the means of letter transmission in the Europe of that time." (p. 1) Presents the 1) Early Posts, 2) Colonial Posts, 3) Constitutional Post and 4) the Continental Congress Post, with a chapter on early postmarks. Text of Neale Patent. Bibliography, illustrations and index. Konwiser, Harry M., editor. United States Stampless Cover Catalogue.Batavia, NY: Milton R. Miller, 1936. From introduction: "Stampless Covers made their appearance in the United States in the Colonial Period, when Benjamin Franklin was the Colonial Postmaster General for Great Britain. "These early postmarks-indicative of the post office of origin on the letter-are of the Straight Line type.... "Markings then, as in the early United States period, and so up to about 1800, were all of the Straight Line type, with..." one exception after 1793." See Phillips, Sampson and Wishnietsky. Library has 1936, 1938, 1942-43, 1947 and 1952 catalogues listing and illustrating postmarks. Lounsbery, Royden H. "American Postal Markings" from Colonial Times to the 1850's: the Unexhibited Exhibit of Royden H. Lounsbery. Photographic record of covers and letters bearing colonial-period postmarks, with commentary. Chronological arrangement. Lowe, Robson. Encyclopedia of British Empire Postage Stamps. London: Robson Lowe, Ltd., 1952. Six volumes. Sixty-three page review of colonial posts noting three: Parliamentary (established 1692), American Continental Congress Post (established 1774-5), and Confederation Post (established 1778). See part one of volume five. Bibliography, illustrations and index. Marshall, C.F. Dendy. The Post Office from its beginnings to the end of 1925. London: Oxford U. Press, 1925. English post from Henry VIII establishing some permanent posts. No direct mention of American Colonies in text. Twenty-three page annotated bibliography of English postal system. Melius, Louis. The American Postal Service: History of Postal Service from the Earliest Times. Washington, D.C.: Louis Melius, 1917. Colonial Post from 1672, with a review of the early British system. Index. Montgomery, Malcolm Beresford. The Postage Rates of the North Atlantic Mails (1635-1950): the inland and ocean postage rates applied to letters between the United Kingdom and North America. Southhampton, England: Malcolm Beresford Montgomery, 1991. Rates from 5 November 1639 for single, double, triple page, and per ounce letters. In chart form, with sources, bibliography and tables. Phillips, David G., editor. American Stampless Cover Catalog: The Standard Reference Catalog of American Postal History. North Miami, FL: David G. Phillips, 1985. Handstamped and manuscript town postmarks, in three volumes, beginning with colonial period. General postal history and postal rates from 1692. Official, semi-official and privately applied postmarks with values. Index. See also Konwiser, Sampson & Wishnietsky. Raguin, M.M. British Post Office Notices, 1666-1899. Medford: Michel M. Raguin, 1990. Act of Queen Anne to establish a general post office in the Colonies, and other notices relevant to the American Colonies in volume one of five volumes. Bibliography, illustrations and index. Rich, Wesley Everett. The History of the United States Post Office to the Year 1829. Cambridge, MA: Harvard University Press, 1924. Dissertation on the Post Office from 1638. Neale's Patent, 1692-1707, and the Colonial Post; the Colonial Post as a branch of the British Post Office, 1707-75; and postal policies, 1639-1829. Tables of growth of the post: letters carried, miles of post roads, receipts and expenditures, and appropriations for the post. Bibliography. Robertson, Alan William. The Maritime Postal History of London. London: Robson Lowe, 1960. Ship letters from 1657 Ordinance and 1660 Act requiring transfer to Post Office upon arrival at London. "The earliest name officially ascribed to a vessel hired by the Post Office to carry letters seems to have been a 'barque,' which developed into 'post-barque.' The term 'packet boat' seems to have become general early in the 17th century, and...exclusively...by 1650...." (p. A.6, vol. 1). Sources, bibliography, illustrations and index; in three volumes with supplement. Sampson, E.N., editor. American Stampless Cover Catalog; the Revised Edition of the United States Stampless Cover Catalog. Albany, OR: Van Dahl Publications. Updates of catalog edited by Konwiser. Library has 1965 and 1971 editions by Sampson. See Konwiser, Phillips and Wishnietsky. Sanford, O.R. and Salt, Denis. British Postal Rates, 1635 to 1839 Beckenham, England: Postal History Society, 1990. Rates for single, double and treble letters, with statutory reference. Sources, illustrations and index. Smith, Alfred Daniel. The Development of Rates of Postage: an Historical and Analytical Study, by A.D. Smith, with an introduction by the Right Hon. Herbert Samuel. New York: Macmillan, 1918. Where the distance from New Yorke to Boston is within 80 miles the postage 6d. Where the distance exceed 80 miles and within 150 9d. Postage to and from Boston to New Yorke being 300m. 12d. To and from Boston to Jersey 370 miles 18d. To and from Boston and Philadelphia 390 miles 20d. To and from Boston to Annapolis in Maryland 550m. 36d. To and from Boston and James Towne in Virginia 680m. 42d. To and from New Yorke to Annapolis 250 miles 24d. To and from New Yorke to James Towne 380 miles and many broad and dangerous Bays and Rivers to be Ferryed over. 30d. Sources, bibliography, tables and index. Smith, William. The History of the Post Office in British North America, 1639-1870. Cambridge: Cambridge University Press, 1920. Canadian postal history from 1760, with a review of American postal history from 1639 - with the first notice of the post among the records of the general court of Massachusetts Bay. Smith was "Sometime Secretary of the Post Office Department of Canada." Index. Wishnietsky, Benjamin, editor. American Stampless Cover Catalog: the Standard Reference Catalog of American Postal History. North Miami: D.G. Phillips Pub. Co., 1978. Third edition, following catalog noted above edited by E.N. Sampson. See Konwiser and Phillips. Allen, John. "Six Hundred Years of Post-Road Repair in England (1150-1750)." Postal History Journal 23, no. 52 (June 1979): 30-6. Claims "church, the guilds, and the local lord were three major instruments of repair," of nine principal roads in England (seven for the posts, one for pilgrimage). Turnpike first appeared in 1706 with "a wooden bar studded with (s)pikes - was placed across a road..." with tolls used to repair the road. Barr, Jere Hess. "The 'B Free Franklin' Letter." Tenth American Philatelic Congress (December 1944): 37. Postmaster General Benjamin Franklin cover with manuscript free frank, apparently a political barb at the Crown, prior to his dismissal. Cover sent to Mrs. Franklin from England, probably during 1773. Illustration. Blake, Maurice C. "Typical Manuscript Postal Markings of the Colonial Period of America." The Congress Book 12 (November 1946): 156-60. Explanation of markings and rates on letters found in collections of historical societies. Illustrated. Browne, George Waldo. "Early Posts and Post Riders." Granite State Magazine 6, no. 10 (May 1910): 177-84. Narrative, which notes after 1639, "Mounted couriers, or men on foot, were employed by government to send its messages to different sections of the country, there being no news-papers...Government fixed the compensation at three pence a mile, while inn-holders were warned not to charge exorbitant prices for their fare and ferry-men were ordered not to delay them on their passage and to carry them free." Notes points on the Old Connecticut Road, or Bay Path; King's Highway, Road to Number Four, and the Great Road, all in New England. Carson, Joseph. "George Washington and The Posts." Collectors Club Philatelist 26, no. 4 (October 1947): 129-48. Washington's writings on the post, with emphasis on the years 1757-96. Sources in footnotes, maps and illustrations. Chambers, Robert F. & Norona, Delf. "Boston." American Philatelist 43 (August 1930): 597-604. "The earliest known Boston postmark is Jun 1, 1772, and is a straight line marking. All letters before this date...seen by authors bear manuscript postal markings." Article is third in a series on United States Post Towns from the Stampless Covers unit of the American Philatelic Society. Franklin, B. & Foxcroft, J. "Tables of the Post of all Single Letters, carried by Post in North-America, as establish'd by Act of Parliment, in the Ninth Year of the Reign of Her late Majesty Queen ANNE, Entitled, An Act for Establishing a General Post-Office, for all Her Majesty's Dominions." Postal Markings 4, no. 6 (November 20, 1934): 61. "The only known copy of the Postal Rates Broadside issued in 1763...[from] the library of the late Dr. Roderick Terry, Newport, R.I."
Scholarly account from Neale's patent (1692) through the American Revolution. Unpublished. Hahn, Calvet M. "Early Town Postmarks on Colonial Covers." S.P.A. Journal 44, no. 11 (July 1982): 781-89. Examination of, "Why are town postmarks found from so few post offices prior to June 1755...?" Presents calendar changes, decentrailized post, and other factors affecting postal markings. Hahn, Calvet M. "The First American 'Post' Law." The Collectors Club Philatelist 52, no. 1 (January 1973): 22-31. November 5, 1639 decree of the Massachusetts Court establishing a post at Richard Fairbanks' house; the location of his home, "the present site of the downtown office of the Boston Globe." Chronology of English postal farm, 1516-1699. Hahn, Calvet M. "The Provisional Post of the United States." The Collectors Club Philatelist 53, no. 3 (May 1974): 158-74; no. 4 (July 1974): 210-26; no. 5 (September 1974): 280-95; no. 6 (November 1974): 354-69; 54, no. 1 (January 1975): 34-45, 52; no. 2 (March 1975): 85-104, 121; no. 3 (May 1975): 162-75; unfinished[?]. Narrative on Benjamin Franklin, William Goddard, William Bradford and others engaged in printing, publishing and controlling the post of Colonial America to distribute their papers, sometimes by subscription. Illustrations and some sources in text. Harper, Ethel. "Benjamin Franklin - Postmaster-General." The Philatelist 8, no. 3 (December 1941): 55-6. Brief postal biography of Postmaster of Philadelphia,1737; Postmaster General of the Colonies (with William Hunter), 1753; and Postmaster General of the Continental Postal System, 1775. By 1783, his organization of the post permitted mail to travel between Falmouth, Maine and Savannah, Georgia, when, "It is estimated ... a man mailed on ... average one letter a year." Development of the post in the South, noting the conflict with Neale (Neale Patent), to 1775. Sources. From the English postal act of 1660 (copying Cromwell) to the late-nineteenth century, including the Neale Patent, the Constitutional Post, the Confederation, and other topics, from a paper read at the Society. Illustrations and index. Kanton, Alvin R.. "William Giles Goddard -- Early Organizer of the United States Postal System." The Congress Book 31 (October 1965): 139-46. Brief biography of a printer, publisher and the first to submit a postal plan to the American Congress (1774). Illustrations and three-item bibliography. Konwiser, Harry M. "Dead Letter Office History and Markings." S.P.A. Journal 6, no. 9 (May 1944): 296-301; no. 10 (June 1944): 333-9; no. 11 (July 1944): 373-7; no. 12 (August 1944): 448-52; 7, no. 1 (September 1944): 37-41; no. 2 (October 1944): 78-81; no. 3 (November 1944): 133-6; no. 4 (December 1944): 177-9. Benjamin Franklin "printed in the 'Gazette' the names of persons who had letters waiting for them...and such as were not claimed were forwarded to the central office in Philadelphia," circa 1753 - the start of the Dead Letter office in America. "Post office operations began July 26, 1775...[under the Continental Congress, which] created a line of posts from Falmouth, in New England, to Savannah, Georgia." Both entries in no. 11 (July 1944): 373. Konwiser, Harry M. "Early United States Posts." Collectors Club Philatelist 7, no. 3 (July 1928): 144-6. Essay on the organization of the Stampless Cover Society and postal research on the separate American Colonies before and after the first postal union among them - 1693, when "mails were regularly transported between Portsmouth, Boston, Saybrook, Philadelphia, Maryland, Virginia and New York." Konwiser, Harry M. "English Markings in the American Colonies." The Philatelist 13, no. 4 (January 1947): 98-9. Claims scarcity of period covers due to British mistakes: firing Franklin and engendering animosity among formerly loyal subjects. "When the 'Sons of Liberty'...decried the imposition of taxes...they also announced that ship captains entering Boston, might well deliver their letters from overseas to the coffee-houses adjacent to the docks, rather than to any of the post offices...[of] the British Crown." Konwiser, Harry M. "Stampless Cover Bibliography." The American Philatelist 43, no. 3 (December 1928): 182-5. Fifty-nine items on early postal service in America. Forty-five entries in philatelic journals. Lowe, Robson. "The American Colonial Post Offices." The Philatelist 9, no. 4 (January 1943): 62-4. Chronological narrative from 1639 to 1783, with illustrations of hand-stamps and Bishop marks, and Herman Moll's map of 1729. McCusker, John J. "New York City and the Bristol Packet: a chapter in early eighteenth century postal history." Postal History Journal 12, no. 2 (July 1968): 15-24. Claims Edmund Dummer organized first trans-Atlantic packet service "linking England and the Western Hemisphere...in 1702." The War of Spanish Succession (or Queen Anne's War) bankrupted Dummer and stopped his packet-ship service. William Warren revived the service, "between Bristol and New York...at the end of 1710 and the inaugural passage westward, made by Captain Shorter in the brig Royal Anne, took fifty days." Warren's service ended in 1712. Resumed in "1755 when the Falmouth packets were established." Footnotes. Moll, H., Geographer. "New England, New York, New Jersey and Pennsylvania." Postal Markings 6, no. 10 (March 20, 1937) 109. An Account of ye Post of ye Continent of Nth. America as they were Regulated by ye Postmasters Gent of ye Post House. The Western Post setts out from Philadelphia every Fryday leaving Letters at Burlington and Pert[h] Amboy and arrives at New York on Sunday night; the distance between Philadelphia and New York being 106 Miles. The Post goes out Eastward every Monday morning from New York, and arrives at Seabrook Thursday noon; being 150 miles, where the Post from Boston setts out at the same time; the New York Post returning with the Eastern Letters, and the Boston Post with the Western, Bags are dropt at New London, Stommington, Rhode Island, and Bristol. The Post from Boston to Piscataway being 70 Miles leaves Letters at Ipswich, Salem, Marblehead and Newberry. There are offices keept at Burlington, Perth Amboy in New Jersey, New London and Stommington in Connecticut, at Rhode Island, Bristol, Ipswich, Salem, Marblehead and Newberry, and the 3 Great Offices are at Boston, New York & Philadelphia. O'Connor, Timothy. "Colonial Postal Laws and Ben Franklin." Postal History Journal no. 88 (June 1991): 30-2. Letter rates from Boston, advertised by Franklin. Charge on illustrated cover exceeded British statutory limit. O'Connor, Timothy. "Rate Markings in Colonial Boston 1711-1765." Postal History Journal no. 81 (February 1989): 15-20. Rates of postage explained using three currencies in use, "pence sterling, specie and the Massachusetts tenors." Orenstein, Norman. "Development of Colonial Mails." S.P.A. Journal 16, no. 2 (October 1953): 81-5. Palmerlee, Albert E. "The American Posts, 1639-1692." Weekly Philatelic Gossip. 65, no. 2 (September 7, 1957): 53-5. Post before Thomas Neale Patent, with review of Biblical, early European and native American stories on conveyance of government messages. Sources and bibliography. Peterson, C. J. "On Postal History." Philatelic Literature Review 21, no. 2 (2nd Quarter 1972): 69-75; no. 3 (3rd Quarter 1972): 145-6; no. 4 (4th Quarter 1972): 195. Bibliography on Colonial Post with supplements, and a review of the Postal History Research Project, American Philatelic Society, for the bicentennial celebration of the United States of America; Alex L. ter Braake, coordinator. Rates of postage were accordingly fixed and authorized, and measures were taken to establish a postoffice in each town in Virginia, when Hale [?] began his operations. Massachusetts and other Colonies soon passed postal laws, and a very imperfect postoffice system was established. Neale's patent expired in 1710, when Parliament extended the English postal system to the Colonies. The chief office was established in New York, where letters were conveyed by regular packets across the Atlantic. A line of postoffices was soon after established on Neale's old routes, north to the present City of Portsmouth, N.H., and south to Philadelphia, and irregularly extended a few years later, to Williamsburg, Va. The post left for the South as often as letters enough were deposited to pay the expense. The rates were fixed, and the post-rider had certain privileges to travel. Finally an irregular postal communication was established with Charleston. When, in 1775, almost every vestige of royal power was swept from the Colonies, the Continental Congress appointed (July 26) Dr. Franklin Postmaster-General. In the autumn of 1776, when Independence had been declared, and Franklin sailed for France, the whole number of postoffices in the United States was 75; length of post routes, 1,875 miles; revenue for about fifteen months, $27,985; annual expenditures, $32,142. Smith, William. "The Colonial Post Office." American Historical Review 21, (1915-16): 258-75. v-files. Arrangements between and among various colonies, emphasizing English ones, to 1775. Sources. Strange, Arnold M. "The Mail Coaches." The Philatelist 13, no. 3 (December 1946): 81-3; no. 4 (January 1947): 114-6. "In America stage coaches were used for the mails from 1756 between Philadelphia and New York -- the journey taking three days...these were four-wheeled trucks with a canvas roof but no sides...drawn by two horses." Mostly covers coaches of the Royal Mail. Wooley, Mary E. "Early History of the Colonial Post Office." Publications of the Rhode Island Historical Society 1, no. 4 (January 1894): 270-91. v-files. Beginning with a letter from Samuel Symonds of Ipswich, dated 1652, complaining of "the uncertainty when and how to convey letters," to the organized posts of the late 1700s, with statutory notices of posts in the Colonies. Footnotes. Ledgers of Dutch and English Customs officials in New York City recording sea-borne commerce, with notes of privateers, pirates, storms, founderings, dates of passage, and other points affecting trade (pelts, tobacco, alcohol, powder, metals, etc.). No direct mention of mail. Sources, illustrations, glossary, appendix (index of ships, merchants, masters, disbursements and geographical). Brigham, Clarence S. History and Bibliography of American Newspapers, 1690-1820. Westport, CT: Greenwood Press, 1976. Two-volume reprint of 1947 issue with 1961 additions and corrections, from the American Antiquarian Society. Introduction quotes William MacDonald, "It is to the newspapers that we must go...to complete our information about the growth of colonial commerce, manufactures, and agriculture...."
Koeppel, Adolph. The Stamps that Caused the American Revolution: The Stamps of the 1765 British Stamp Act for America. North Hempstead, NY: American Revolution Bicentennial Commission, 1976. Revenue stamps issued in the American Colonies by British government at the close of the Seven Years War. Sources, illustrations, and tables. Library of Congress. List of the Benjamin Franklin papers in the Library of Congress, Compiled under the direction of Worthington Chauncey Ford, chief, Division of Manuscripts. Washington: GPO, 1905. Chronological arrangement of letters, papers, printed books and newspapers save "diplomatic records" retained by the Department of State. Collection acquired by U.S. Government at private sale from Whittingham estate in 1882. Publishers (and printers) and postmasters (distributors) of colonial newspapers, in two volumes; second edition and reprint of 1874. The "Edwin Mayer" Collection of Pre-Stamp and Stampless Covers of United States. H.R. Harmer, Inc., NY, February 17, 1967. Twenty-three lots of Colonial covers from Connecticut, Massachusetts, New Jersey, New York, Pennsylvania, South Carolina and Virginia, all in sale 1751. Written descriptions. Illustrations of Pre-Stamp & Stampless Covers of United States. H.R. Harmer, Inc., NY, February 17, 1967. Twenty-three page catalog of Edwin Mayer Collection, sales 1751 and 1752; realized $54,479.50 for 739 lots. Illustrations [see above entry for descriptions].